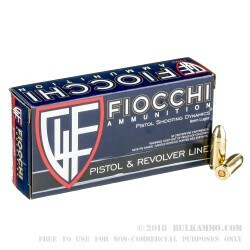 This case of 9mm Fiocchi ammunition will provide a superior shooting experience at a bulk price. Ideal for everything from Luger P08s to Smith & Wesson M&Ps and Springfield XDs, these cartridges use a balanced 124 grain full metal jacket bullet and achieve a muzzle velocity of 1150 feet per second. The average muzzle velocity belies the cartridge’s gentle recoil, a significant bonus in the long shooting sessions made possible by the 1,000 round case. 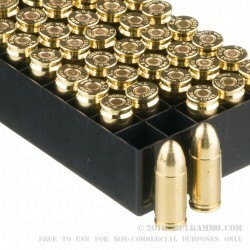 Each of the boxes in this 20-box case holds 50 rounds in reloadable Boxer-primed brass cases. Fiocchi Munizioni has produced ammunition at its headquarters and main factory in Lecco, Italy since 1872. In the 1980s, the company embarked on a successful expansion to the US market and currently operates a thriving business from its American production plant in Ozark, Missouri. Fiocchi America’s facility produces shotshells as well as centerfire pistol and rifle ammo, leaving the Lecco factory free to manufacture rimfire cartridges and military ammunition for NATO customers. Excellent ammo, 1 FTF after over 1000 rounds fired, not sure why, maybe it was just a bad round. Still only 1 FTF in over 1000 rounds, 0 FTE. This is an excellent brand of ammo, one of the cleanest I've shot but I'm still a rookie with only 6 months of having my lady by my side and giving her a good pull of over 2000 happy times from my finger. 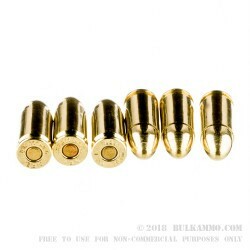 Great ammo, excellent company, and it's from BULKAMMO.COM so it's a win-win situation. A: Thank you for giving Bulk Bammo the chance to clear this up. 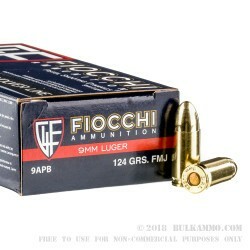 These rounds from Fiocchi are loaded with an FMJ bullet which is a lead slug encased in a copper jacket. They are not lead free. A: Hello Jim! Fiocchi lists the muzzle velocity of this 124 grain round as 1150 fps.